Astonishing amounts of snow have fallen in the past two weeks across much of Virginia, Maryland, Delaware, Pennsylvania, and parts of New Jersey. All the major weather stations in the DC to PHL region have recently broken their seasonal snowfall total records going back over a hundred years, and rivalling more anecdotal amounts from the colonial era in the 18th century. Seasonal totals are in the 60-70 inch range at these major locations and 80-100 inches at outlying rural sites. Much of this fell in four storms from Jan 30 to Feb 10, although there was also one large snowfall on Dec 19-20. Recently there was a widespread 20-30 inch snowfall on Feb 5-6, quickly followed by wind-driven 12-18 inch amounts on the 9th-10th. There were blizzard conditions for part of the day in Baltimore and some counties of eastern PA. You should consider joining the easternuswx.com forum which is very similar to this one, to see the photos (otherwise you can't access them). The amount of snow that has fallen has a calculated return period of 420 years and the season is far from done, in fact, there's another 5-10 inch event possible in these regions on Monday. Meanwhile, another storm developed today in Texas and dropped as much as 10-12 inches in the Dallas-Fort Worth region, an all-time record for them. This storm has since moved on to Louisiana and is aimed for Georgia and the Carolinas where more heavy snow seems quite possible later today and on Saturday. The warm sector of this low is not all that warm but is tracking across southern Florida with temps near 21 C, but northern Florida is getting either a cold rain or melting snow. This storm is predicted to miss the coastal regions north of North Carolina and head out to sea, but then the next system develops in its wake. Meanwhile, it continues very mild and recently has turned wet on the west coast here, making conditions very difficult for the organizers of the Winter Olympics. Events this weekend may have to be postponed into the week when better conditions are expected, but until about Monday we are expecting a high freezing level, fog and rain well up the slopes, and very mild temperatures even into the lower alpine. It is not exceptionally cold anywhere in North America (although in relative terms it is very cold in the south), but a steady modified arctic flow is coming from Baffin Island south across Hudson Bay and into the Great Lakes which have had a very dry winter, except for a couple of places that had heavy lake-effect squalls, most stations have had 20-40 per cent of normal snowfall there. Toronto is still on pace to record a new minimum seasonal total although I feel that it won't stay that dry to the end. The eastern provinces of Canada have also had less snow than usual, as the storm track has tended to run far out to sea and recurve back into Labrador, covering the region in dull easterly maritime flow patterns with temperatures running 0-3 C much of the time. tryng to download this set off various alarm procedures on my pc which took a while to clear so others beware! Sunny and quite warm here today, 15 C at 2 pm. If you're following the Winter Olympics you probably saw the clear skies in recent days, at least it's cold at night in the mountains so they have some time to prepare the ski and snowboard courses. But the golf courses are also in good shape, it hasn't rained for several days and the ground is as dry as late spring -- cherry blossoms are coming out several weeks early, and green shoots are showing on the trees and shrubs. Just like the last major El Nino in 1998. May have some pictures later, the natural snow line is sitting at 1200 metres compared to the normal 400-600 at this time of year. And we have had about one day of snow at my elevation of 120 metres, the least snow I have observed at this location since moving here in 1995 (and therefore the least snow I've seen in any winter of my life including probably the first seven in B'ham although I'm not too sure about any of those, but if it snowed more than three inches, they are not as sparse as this winter here). Here's a picture taken on Friday. 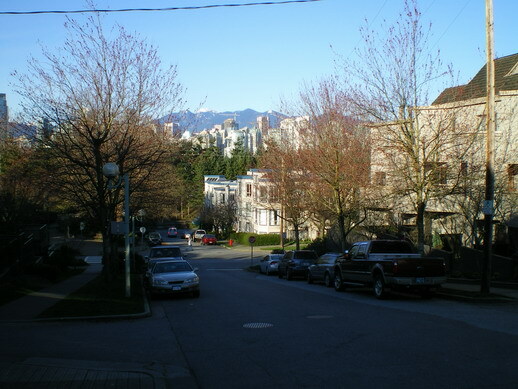 View is north with Vancouver's city centre in the middle ground, as you can see, not much snow on the coast range over on the north shore. Snow only near the summits, but further north where mountains are higher, snow cover is from about 4500 ft to summit levels (11,000 ft locally). What you see at Cypress Mountain (which is just off to the left of this shot) is artificial or transported snow, the natural cover is bare at this point. Congratulations on the wedding, I know how you feel, I'm getting married on May 30th. So hope its nice weather. Congrats Rich, is this to be in Canmore or Nelson? The weather here (west coast) today was absolutely foul, very strong SE winds ahead of a front, gusting at times to about 60 mph, then lashing rain and not very mild either, 8 or 9 C but it felt more like subzero in the wind. As of 8:15 pm local time, it is still blowing a gale and howling outside. Trees down here and there, nothing too major (on the news, I didn't see any real damage). Meanwhile, the eastern third to half of N America is very warm, highs were in the 70s and even 80s F in the eastern states and southern Ontario on Friday, and will get up there again tomorrow. The warm spell is going to end in stages with gradual fallback to near normal values from Sunday on. I have the feeling this could be an above normal severe weather season in the plains states. For one thing, there is a lot of moisture in the picture this year after a snowy winter and lots of rain in some parts the past two months. Kansas City for example had 44 inches of snow, normal there being about 15. Oklahoma City has also broken their seasonal snowfall record. Not sure how it worked out for Rich in Canmore but from Calgary east and south they have 20-30 cms of snow and northerly winds 55-75 km/hr this morning (local time). I suspect Rich is on the edge of this as Banff further west is reporting 3 C and partly cloudy. I saw more actual snow fall in the UK the month before i came to Edmonton in jan than i have seen since i arrived..apart from the last week of Jan it hasnt been anywhere near as cold as i was expecting..last week we reached 26c a record for April. Its been snowing here for 3 days, however not been sticking. The snow level is approx 50 ft above my house. If you have ever been frustrated with snow, this might just match it. I am looking out the window and the grass and dirt track up the hill are covered. Will try and get a picture. yeah we've had a mix of rain sleet and snow most of today as well...like a cold wet january day back home..not great. finally stopped raining here in edmonton..i understand it has ben a cold very wet spring here..hopefully going to get some summer weather from mid week next week after short warm spell over the weekend. Exceptionally cold for mid-July across most of Alberta and Saskatchewan today, even well out into the prairies, highs only 10-12 C at places that average 26-28 C. Probably all-time record low minima for dates and possibly the whole month of July (although I remember seeing snow in Banff on July 31, 1964 as a kid on summer holidays). This will moderate fairly quickly today. The chill also reached parts of BC after a week of hot, dry weather, but here on the coast the issue was strong winds on Monday despite sunny skies. The interior valleys have had some sporadic showers with gusty winds, doing more good than harm to the forest fire situation which was beginning to change from low risk to moderate during the hot, dry week. Anything that got started was whipped around by the strong winds, fortunately not much was going on before the fronts came through. Risks are probably back to low again thanks to the rainfalls. Parts of Alberta mainly just north of Calgary have seen 2-4 inches of rain with this slow-moving closed low and that is just letting up now, as the system weakens. Parts of southern SK had gusty storms earlier today and the temp dropped to only 10 C in one of those as far south as Rockglen on the US border. It has been as hot as 42 C there on the same date. we seem to be on a daily treadmill of thunderstorms right now...i think i have seen a storm at least every other day for a month now..this last week it has been very wet even by uk standards..the canadians guys out on site say they havnt seen anything like it. Its usually sunny and warm and pretty dry..seems like wet summers are following me around!! looks like its going to pretty crappy again this week! Are you getting tired of them yet? Sounds like you wil be getting a break from them for a bit.